Four years after a massive earthquake and tsunami devastated parts of northern Japan, the crippled Fukushima Daiichi nuclear plant is still decades from being decommissioned and environmental problems continue to mount. As the anniversary passed, Prime Minister Shinzo Abe's government planned to reopen the country's nuclear plants despite widespread public opposition and ongoing safety concerns. Opinion polls have consistently shown that the majority of people do not want the plants to be reactivated. Japan's 48 nuclear plants have been offline since September 2013. The plants were shut down following the partial meltdowns at the Fukushima plant. Reactors 3 and 4 at Kansai Electric Power Company's Ōi plant in Fukui Prefecture, were restarted in July 2012, before being closed again the following year [WSWS]. There has been more than radioactive fallout culminating from the Fukushima disaster. Whilst some 6,000 employees have returned to the Fukushima Daiichi power plant to work there daily, its ruins still pose a significant threat. Nuclear radiation remains dangerous in and around the destroyed reactors. Villages in its proximity remain a no-go zone for inhabitants, and may be uninhabitable for some time to come. The nuclear power plant itself is far from being secure. Its owner TEPCO has so far been unable to remove hundreds of fuel rods stored nearby because the 2011 earthquake destabilized or destroyed large parts of the buildings. Meanwhile radiation continues to contaminate underground water. But despite the contamination of large swaths of land, agricultural products and water resources, as well as growing opposition to nuclear power, Japan's government remains convinced that nuclear energy will be an inevitable energy source for the country in the future [Washington Post]. According to some surveys, 70% of Japan's population oppose a reliance on nuclear energy. Given the long term effects of the disaster it is perhaps understandable. Japan has been particularly affected by the negative impacts of atomic energy. It is the only country, thus far, to have had the misfortune of having been bombed with nuclear weapons. It is this history that recently prompted the daughter of two Hiroshima victims to speak out and call for an end to the use of both atomic weapons and nuclear power. The anti nuclear message has spread beyond Japan. Germany has already made a commitment to end its reliance on nuclear power following the Fukushima disaster. 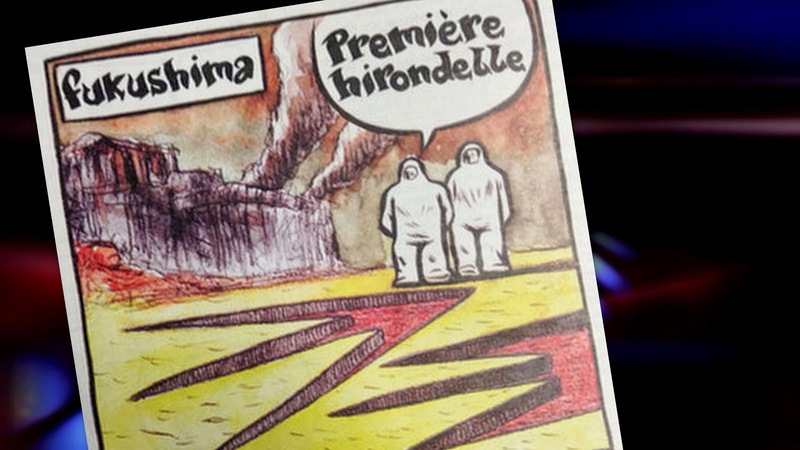 Meanwhile, the French satirical magazine, Charlie Hebdo has marked the anniversary with its own take of the risks of nuclear power. 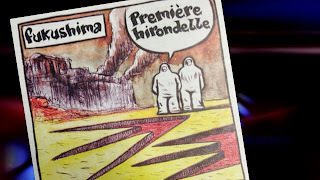 In the March 19th edition a cartoon shows two people in protective NBC suits talking about this year's first swallow while looking at footprints of a giant bird whilst a nuclear power plant spews out smoke in the background. The suggestion is of course that the first swallow had mutated into a gigantic monster due to the radioactive leaks. Not everyone has headed the warnings however. Pakistan for instance is going ahead with its plan to construct a nuclear power plant in an area vulnerable to tsunamis near Karachi. This despite an outcry from the city's nearly 20 million inhabitants [Washington Post]. Many have for years feared that terrorists might attempt to steal one of Pakistan's nuclear bombs and detonate it in a foreign country. But the building of a nuclear power station in such a high risk area may area may well bring disaster far closer to home. Unfortunately it is only when disaster strikes close to home that attitudes change. But by then it may be too late.